Here s some sticker news that is sure to stirrup major excitement Introducing a new addition to the bestselling series with over 1 million copies in print. 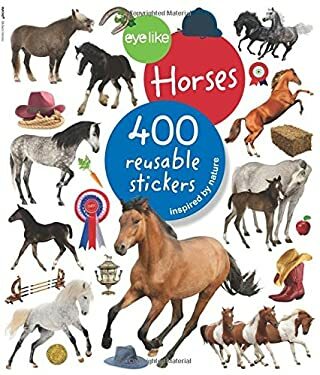 Packed with over 400 full-color equestrian themed stickers, "EyeLike Stickers: Horses" will bring unbridled joy to every horse lover, crafter, and scrapbooker with high-quality, photographic images that are amazingly lifelike in color and detail. The durable stickers are designed to be stuck on and peeled off over and over again without losing adhesive.Every page of stickers captures the excitement of the racetrack and the beauty of the stable and meadow. Horses include Athletic Arabian stallions, graceful Andalusians, and elegant Mustangs. Plus racehorses, show ponies, wobbly legged foals, and tons of horse ephemera.Use them to decorate notebooks, cards, scrapbooks, crafts, party invitations, lunchboxes, riding helmets, even windows; create a lively scene on the book s inside front and back covers which double as glossy illustrated backgrounds and change them up when the mood strikes. "EyeLike Stickers" provide quality and quantity for the compelling price of $6.95. "